Site awards are given to outstanding web site design and content. 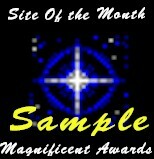 Each month one site earns the Magnificent Site of the Month Award. There are only 12 sites a year that recieve this award. This site is outstanding in all areas of web design and content. These sites are a must see. Tell A Freind about Magnificent Awards.